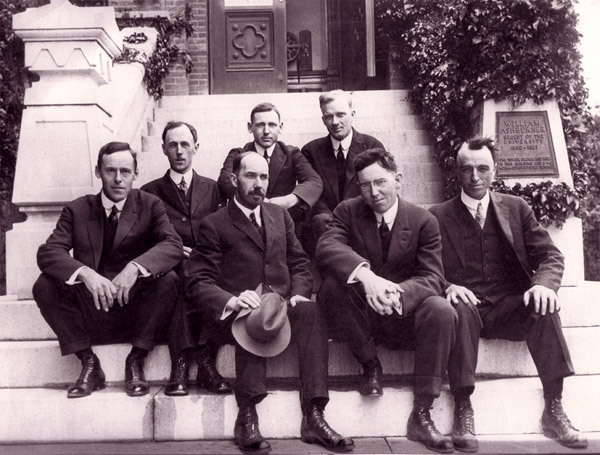 Faculty and instructors of the Department of Paleontology, circa 1915. Top row, left to right: Earl L. Packard, W.S.W. Kew, J.O. Nomland. Bottom row, left to right: John P. Buwalda, John C. Merriam, Chester Stock, and Bruce L. Clark. If the date on this photograph is correct, then only Merriam was a professor at that time, although Buwalda, Stock, and Clark were appointed professors in geology a few years later. Photo from the UCMP Archives. 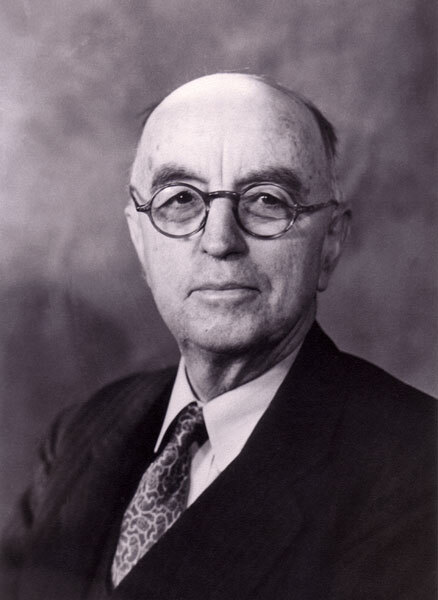 Until the appointment of Bruce Clark, an invertebrate paleontologist, to the faculty in 1918, the Paleontology Department consisted of only John C. Merriam. Merriam had taught, with the help of students and graduates as instructors (right), a broad set of courses. The beginning paleontology course was attended by 250 students at a time. The future of paleontology looked glorious and Annie Alexander was pleased. She had great hopes and had invested much money in Merriam’s paleontologic research and her own collecting expeditions. However, Merriam had additional goals, as his interests moved towards administration and the scientific community beyond Berkeley. In 1920, he became Dean of the Faculty and then he left Berkeley at the end of the year to accept the presidency of the Carnegie Institute from 1921 to 1938 in Washington, D.C. He continued to be associated with Berkeley and stayed involved with paleontology there, with the blessing of the campus administration who thought of him as a positive figure to have associated with the university. Much of his Berkeley-based work was published in Carnegie publications. Annie Alexander was greatly disappointed by this change of emphasis in Merriam, his move and the lack of acknowledgment of the University. A sometimes bitter relationship, which had been simmering for several years, developed between them (well described by Stein 2001, chapter 17). The departure of Merriam did not end his input to the Paleontology Department, much to Alexander’s frustration. She was unable to counter this interference, so she brought pressure on the University to establish a Museum of Paleontology separate from the Department. She proposed that she would increase her funding to the museum through her own resources, if the university would do likewise (Stein 2001). However, Merriam was to have nothing to do with the new museum. 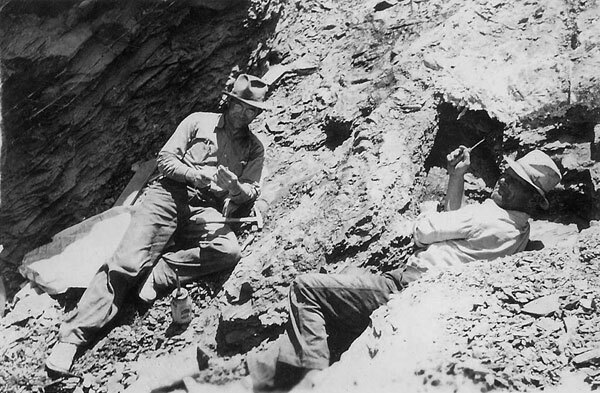 The University accepted her proposal and established the Museum of Paleontology in 1921 with Professor Bruce Clark (left) as its director. In the meantime, Merriam lobbied from Washington first that no one be appointed in his former position as chairman of the Department of Paleontology, and then for the appointment of Ralph Chaney as chairman, leading to so much indecision and discord that paleontology once again became part of the Department of Geology. The fossil collections passed to the new Museum of Paleontology but were housed with the departments. Clark remained a professor in geology, which had also added two vertebrate paleontologists in 1921 to its faculty: Chester Stock and John Buwalda, both students and collaborators of Merriam’s (Buwalda and Merriam 1916; Merriam and Stock 1921, 1925; Merriam et al. 1925). In the museum, Clark was joined a year later by Charles Camp, a student of Grinnell who held a position in the Department of Zoology. 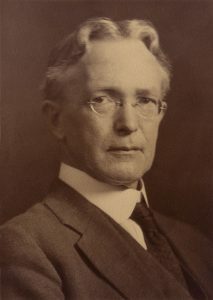 Merriam, now aided by Stock, was still involved in the affairs of the department and UCMP so much so that Clark decided in 1926 to resign the directorship of UCMP. After much delay, the University appointed Ralph Chaney, a paleobotanist from Iowa, as Director of UCMP, but Alexander objected sternly to this because she believed this was more interference from Merriam, and she withdrew all support for the museum (Stein 2001). The administration then changed its course and recanted its offer to Chaney. Buwalda and Stock left Berkeley in 1926 for positions in the newly forming Geology Department at Cal Tech. Shortly thereafter, in 1927, the university appointed William Diller Matthew (left) as director of the Museum of Paleontology and chairman of the reestablished Department of Paleontology (Gregory 1996b; Stein 2001). He had been at the American Museum of Natural History for 33 years and had an outstanding record of high quality research and publication in vertebrate paleontology. With his appointment and the departure of Merriam’s collaborators, tranquility fell on the museum and department. Alexander’s hopes were once again renewed and she began anew her annual donations of support to the museum. This feeling of accomplishment and hope lasted only three years before Matthew passed away from kidney failure in 1930. This began yet another round of dispute in paleontology. Alexander met with President Gordon Sproul and they agreed that Charles Camp should be appointed director of UCMP, if she would continue her support of its activities, but Sproul decided that Ralph Chaney, Merriam’s own choice, would become chairman of the Department of Paleontology. Alexander was dismayed and began a series of negotiations with Sproul and the Regents. Nevertheless, Chaney was appointed, and soon difficulties between the museum and the department ensued. Much of this revolved around how Alexander’s gifts to the museum would be used; Merriam and Chaney, she believed, wanted to be involved in the museum’s affairs, and to this she objected. She again met with Sproul to explain her desires of complete separation of the Museum from the Department of Paleontology, physically and financially, with separate staffs for each. Camp would be totally in charge of the Museum and the others would have no say in its operation at all. She told Sproul that if he implemented these things, then her level of support would remain; if not she would withdraw it. The university agreed to her demands, and the two units and their leaders were separated completely (Stein 2001). Chairs of the Department of Paleontology. *Simultaneously director of UCMP; **Acting chairman; ***Chair of Integrative Biology. Alexander then decided to approach Sproul about new and safer facilities for UCMP. 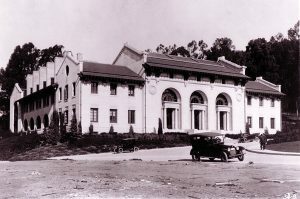 The Museum was moved to Hearst Memorial Mining Building (right) in 1931 where it remained for 30 years. During this time, the administration of the museum and department were sometimes joined under one person appointed as Director and Chairman and at other times they were separately administered (right). While tensions existed between various factions of the department and museum, as is common in small organizations anyway, the two units, one supporting research and the other carrying out academic functions, ran fairly smoothly. In 1934, Annie Alexander thus endowed UCMP with the significant funds she had promised in 1921. She continued her research support as well over the years and in 1948 made a final contribution to the UCMP endowment. In 1948, she also established two graduate student scholarships, one in paleontology and one in vertebrate zoology. These are still administered by UCMP and MVZ. At the time of her death in 1950, she had donated substantial and nearly equal sums to the UCMP and MVZ as endowments and much over the past half century to support the research and students in each museum. Both museums today benefit from her generosity and foresight. Annie Alexander’s support for field work in paleontology continued after 1930 significantly. Now she was supporting the work of Charles Camp and Sam Welles, who often teamed up together on big projects. These included excavations of ichthyosaurs near the ghost town of Berlin, Nevada, the discovery in Arizona of Dilophosaurus, the spitting dinosaur incorrectly but famously portrayed in the movie Jurassic Park (Crichton 1990; DeSalle and Lindley 1997), work in New Mexico (Fig. 18), and many other projects, most of which involved students too. Welles was famous for his field prowess — he could find fossils where no one else ever could (Camp 1969). From February 19 to October 29, 1939, and May 25 to September 29, 1940, the San Francisco Bay area hosted the Golden Gate International Exposition on Treasure Island to celebrate the openings of the San Francisco-Oakland Bay Bridge (1936) and the Golden Gate Bridge (1937), the economic strength of the Bay Area, the unity of the Pacific, and the hope that the Bay Area would be a gateway to the Pacific Rim. The Exposition was crowned by elaborate buildings and sculptures of all sorts by many artists. UCMP participated with its own exhibit, featuring the sculptures of William Gordon Huff (Fig. 19). On the opening day of the Exposition, well over 100,000 people visited. As a result of the popularity of the Exposition, it was extended for another summer season in 1940. UCMP still has the Huff sculptures in its collection of non-fossil materials.